Prostate Health Education Network (PHEN) – 100 Black Men of America, Inc. The Prostate Health Education Network (PHEN) and 100 Black Men of America, Inc., through its International Health and Wellness Committee, will raise the awareness for early detection and treatment of Prostate Cancer, particularly in the African American community. Our two organizations form this partnership to combine our collective voices and leverage our individual organizational influence to increase awareness of this disease that threatens and drastically impacts males and their families. The mission of the PHEN is to eliminate the African American Prostate Cancer Disparity. 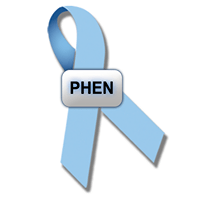 The 100 and PHEN both acknowledge and agree that knowledge is the best defense against prostate cancer, and through this partnership, both organizations endeavor to help reduce confusion about how to detect, treat, and cope with Prostate Cancer among men at highest risk.